The first persons to use logarithms for calculation of interval sizes were Bonaventura Cavalieri (1639), Juan Caramel de Lobkowitz (1647), and Lemme Rossi (1666). Also Christiaan Huygens was among the first to do this. Earlier calculations of equal intervals sizes, like those of Simon Stevin (1585) and Marin Mersenne (1636) were done by square and cubic roots. The logarithm, invented by John Napier in 1614, is a mathematical operation that turns a multiplication into an addition, and by the same definition, raising to a higher power into multiplication. Because stacking two intervals involves multiplication of frequency ratios, this is equivalent to addition of the logarithmic measures of these ratios. See also Interval size measure. 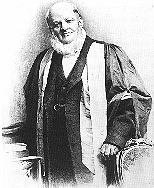 Defined by Alexander John Ellis (1814-1890) (see photo) in 1884 and presented in the article "The Musical Scales of Various Nations" as well as in the appendix of his English translation of Hermann von Helmholtz' book Die Lehre von den Tonempfindungen als physiologische Grundlage für die Theorie der Musik. One cent is one hundredth part of the semitone in 12-tone Equal Temperament, a centisemitone. The frequency ratio represented by one cent is the 1200th root of 2. So the 12-tET whole tone is 200 cents, the minor third 300 cents, the major third 400 cents, etc. Rounding to the nearest cent is sufficiently accurate for practical purposes. Cents are the most universally used interval measure. They have the advantage that familiar intervals have an easily rememberable value. Ellis, whose real name was Sharpe, is also regarded as the founder of the field of ethnomusicology. He invented cents originally for the purpose of expressing non-Western scales. In a different form, this measure was invented earlier by Heinrich Bellermann (1832-1903), namely the logarithm with base twelfth root of 2, which has a size a hundred times larger than a cent, the same size as an equal tempered semitone. Contrary to cents, it was meant to be used for Western classical music. This measure was also endorsed by Paul von Jankó. Bellermann received little acknowledgement for it, because people adopted Ellis's cents much more enthusiastically. It goes back to Isaac Newton, who also expressed intervals in terms of 1/12 of an octave in 1665. Not a fixed measure as such but often used as an interval unit. The syntonic (Didymic) and Pythagorean (ditonic) commas have almost the same size. In the past they were often confused and their difference was often neglected. The word coma is Latin for hair. There are 55.79763 syntonic commas and 51.15087 Pythagorean commas in the octave. Therefore one step in 53-tET is often named a comma because it's in the middle of them and 53-tET is a very accurate approximation to 5-limit just intonation scales. The major whole tone 9/8 is 9 commas and the minor whole tone 10/9 is 8 commas. The chromatic and diatonic semitones are 4 and 5 commas. In regular meantone temperaments where the tempering of the fifth is expressed in a fraction of a comma, the comma is the syntonic comma. In well-temperaments, like Werckmeister's, where the cycle of fifths closes in a circle, the temperings are usually expressed in fractions of a Pythagorean comma. The measure 1/55 of an octave is called a Sauveur comma and 1/50 of an octave could be called a Henfling comma. Defined by Joseph Sauveur in 1696 as one tenth of an eptaméride. Used in Byzantine music theory? Approximately 1/12 part of the syntonic comma and 1/13 part of the Pythagorean comma. Defined by Joseph Sauveur in 1696 as one half of an eptaméride. Like comma, also an interval. The name was used by ancient Greek theorists like Aristoxenos for several different intervals. Marchettus de Padua (Marchetto Padoano), in his Lucidarium written in 1317/1318, was the first to use it as a standard measure. He divided the whole tone in 5 parts, called a diesis. The chromatic semitone (semitonium enharmonicum) was 2 dieses, the diatonic semitone (semitonium diatonicum) 3 dieses and another chromatic semitone of 4 dieses was meant for some augmentations like C-C giving a very high leading tone. See also this essay. Later the minor or enharmonic diesis became the difference between an octave and three pure major thirds. There are 29.22634 of it in an octave. Adriaan Fokker used this name for the step of 31-tone equal temperament, where it is also equal to 1/5 part of a whole tone, because of its similar size. This 1/31 part of an octave called normal diesis by Fokker is a convenient measure in which to express 7-limit just intervals. The Angle was proposed by Moritz Dröbisch in the 19th century as a cycle of 360 degrees to the octave. Andrew Pikler has suggested this name in his article "Logarithmic Frequency Systems" (1966). Not an interval measure, but a logarithmic absolute pitch measure. Proposed by Robert Stuckey and described in the paper Ellis at Belfast by Jeremy Montagu. It's the number of cents relative to the 64-foot C (16.3516 Hz), with the number of octaves written as a subscript in front of the number of cents. For example the A at 440 Hz is shown as 4900. The abbreviation is El, as Hertz are abbreviated to Hz. Both spellings used by Sauveur. See méride and savart. Sauveur's rule to find the number of eptamérides of intervals smaller than 7/6 is as follows: multiply the difference of numerator and denominator with 875 and divide by the sum of numerator and denominator and round the result to the nearest integer. This is known as the bimodular method of approximating logarithms and can be used for other measures as well. Measure proposed by al-Farabi in the 10th century, from Mehdi Barkeshli, "Perfect scale of Farabi and his proposed scales", Iranian music, a collection of articles. Measure proposed by Gene Ward Smith for use with (nano-)temperaments. The Pythagorean comma is nearly 900 flus (899.9259), the syntonic comma 825 (824.9812) and the schisma 75 flus (74.94472), alas not divisible by 2. It's an alternative to the Temperament Unit which, although used with 5-limit temperaments, is not 5-limit consistent, whereas flus measure intervals consistently up to the 9-limit. This makes 613.81047 Grads to the octave. One Grad is the difference between a pure fifth of 701.955 cents and a 12-tET fifth of 700 cents and makes it a useful measure to describe temperings in a well-temperament. The name comes from Andreas Werckmeister (1645-1706) who used it to denote different divisions of a comma. It has a negligible difference to 1/11 part of a syntonic comma. Jan van Biezen calls this measure a Werckmeister, symbol Wm. Organ builders sometimes use this symbol, and approximate its size by 2 cents. Another useful property is that the minor diesis is almost exactly 21 Grad (21.002). So deviations from equal temperament of three consecutive major thirds when expressed in Grad always add up to 21. A Grad is slightly bigger than a schisma, 1.000655 times. A twelve-based measure suggested by Paul Beaver: 1728 is 123. In the 1960s he asked John Chalmers to compute a table of Harmos, which he did later in decimal and duodecimal notation. Defined by Heinz Bohlen as the hundredth part of a step of the equal tempered version of the Bohlen-Pierce scale: the 13th root of 3/1. Hekt are therefore the BP analogon to cents. See H. Bohlen, "13-Tonstufen in der Duodezime", Acustica vol. 39, 1978. There are 820.2086796 Hekt to the octave. Proposed by Margo Schulter on the Tuning List in 2002 and indicated by the Greek letter iota. The classic chromatic semitone 25/24 for example is 100.12 iotas. It's useful for comparing just intervals with 17-tone equal tempered ones. The Iring unit was defined by Widogast Iring in his 1898 Die reine Stimmung in der Musik. He noted that the twelfth part of the Pythagorean comma and the schisma have almost the same size, both about 1/614 part of the octave. To get round numbers, he took for this size one 600th part of an octave. The size of the major second can then be rounded to 102 and the just major third to 193. The perfect fifth is 351 Iring units. The size of the Iring unit is twice the size of the cent. It is also about the smallest difference in pitch that untrained ears can hear. The same unit was later defined in 1932 by Joseph Yasser in his book A Theory of Evolving Tonality by dividing the equally tempered whole tone in 100 parts and calling it the centitone. This measure was proposed by Gene Ward Smith because it is consistent up until prime number 37 which means rounding to the nearest integer jinn will (usually) give the correct answers to this limit. This name was given by Augustus De Morgan (1806-1871). The 10-base (Briggs) logarithm of 2 (10log 2) is 0.30102999566 so multiplied by 10000 this makes almost exactly 30103. Expressing intervals in this measure has the advantage of being able to calculate interval combinations without using logarithms, because rounding to the nearest integer jot will (usually) give the correct answers, at least for the prime numbers up to 11. And the jot values can be looked up in a 10-base logarithm table. A similar measure is the savart. This name was chosen by Andrew Aaron Hunt. One mem is equal to 12 minas and very close to 3 schismas and 4 Hekt. It has good approximations for the minor third (54), major third (66) and perfect fifth (120). This name was chosen by Joseph Sauveur (1653-1716) in 1696. The méride and eptaméride were the first logarithmic interval measures proposed. Sauveur favoured 43-tone equal temperament because the small intervals are well represented in it. He had set the comma to one step, then found a range of 2, 3 or 4 steps for the chromatic semitone, corresponding to 31, 43 and 55 tones per octave. He found 43 to be optimal because 4 steps is almost exactly a 16/15 minor second and 7 steps almost exactly the geometric mean of three 9/8 and two 10/9 whole tones. The chromatic scale contained in 43-tET is virtually identical to 1/5-comma meantone tuning. This divides the 12-tET semitone into 214 = 16384 parts which resolution makes sufficiently accurate tuning of electronic instruments possible. See the MIDI Tuning Specification 1.0. There are other MIDI tuning units which differ per manufacturer, for example Yamaha has models tuned in 1/768 or 1/1024 parts of an octave. There's also the MIDI Pitch Bend message, which can carry the values -8192 .. 8191, so when the range (which is variable) is the standard range of +/- 200 cents, then the unit is 1/49152 part of an octave or 0.024414 cents. Named and used by Arthur Joachim von Oettingen (1836-1920) in his book Das duale Harmoniesystem (1913). Alfred Jonqière indicated the millioctave with the Greek letter mu. It was first used however by John Herschel in the book which he wrote with George Bidell Airy On Sound and Atmospheric Vibrations with the Mathematical Elements of Music (1871). Sometimes millioctaves are propagated as a "value-free" substitute for cents, not having the 12-tET bias, because the round cent numbers may lead people to the false belief that the intervals are perfectly in tune. However using these millioctaves introduces a 10-tET bias, which is a much less familiar tuning. Often the cent values of just intervals are easy to remember by their deviation from the 12-tET multiple of 100, for example the pure fifth is 702 cents, with millioctaves this is harder: 585 millioctaves compared to 583.333. Another advantage of cents is the size of the schisma: almost 2 cents against 1.63 M.O. Suggested by Erv Wilson, Gene Ward Smith and Gavin Putland. It's 1/1023 part of 100 cents so close to 1/1000 semitone hence the name mil. It's very close to three times the size of the Temperament Unit and therefore has the same kind of advantages. Named by Dave Keenan and George Secor as an abbreviation of "schismina". It's 0.487805 cents or 1/205 part of a 100 cent semitone, and selected because 2460-tone equal temperament is consistent up to the 28th harmonic and its step is therefore a useful measure to express high-limit just ratios in, and getting very little roundoff errors. They use it in the development of their Sagittal notation system. Although for that purpose the exact size of one mina is 1/233 part of a Pythagorean apotome, or 0.487918 cents or 1/2459.427234 octave. Defined as 1/30 part of a fourth by the theorist Cleonides around 100 AD for description of Greek tetrachords. Likewise Aristoxenos used a cipher of 12 parts to a whole tone. This measure is surrounded by controversy, because it's very unclear what Aristoxenos' measurements exactly are. Moria is Greek for molecules or small pieces. 72-tone equal temperament is a good approximation to many just intonation scales because the prime numbers 2, 3, 5, 7 and 11 are very well represented with deviations not exceeding 3 cents. This measure was suggested by Tútim Dennsuul. It is a highly composite number. Therefore many tempered intervals can be expressed with high precision in this measure, but also many just intervals. One Purdal is 4/33 cent. One harrop is 7.0183 cents and there are close to 171 harrops in an octave. It was proposed by Todd Harrop as an equal tempered equivalent to the quark. The name quark was chosen by Heinz Bohlen and is derived from a set of supposedly four JI mini-intervals in the 7 cents range. Two of them have been identified by him: a = 6.990 cents (3, 4, -5) and b = 7.200 cents (-8, -3, 7). The other two still need to be determined, but can be replaced by the small semitone (3, -2, 0). Harrops are practical for showing interval relationships in the JI BP scale as whole numbers, e.g. the various JI semitone sizes measure between 19 and 24 harrops. Any interval and all its enharmonics can be represented by an integer without rounding inconsistencies. See also The 271-Tone BP Scale. This measure was defined by Joseph Sauveur (1653-1716) in 1696 as eptaméride, one seventh part of a méride. Later in the 20th century its name became savart, after the French physicist Félix Savart (1791-1841) who also advocated it. In French acoustical literature it's still used now and then. It is close to 100 times the base-10 logarithm of 2 and therefore almost as accurate as jots in calculations. So Sauveur proposed it because 301=7×43 and Savart because 301(.03) = 100×10log 2. Later the name savart was used in the book The Physics of Music by Alexander Wood to denote the slightly different value of 1/300 part of an octave. This would make it more practical for expressing 12-tET intervals. In some literature the savart is taken to be the 100/30103 part of an octave, making it exactly 100 jots. Like comma, also an interval: the difference between the Pythagorean and syntonic comma. Because it is so small it is also useful as a measure. The syntonic comma is 11.008 schismas, the Pythagorean comma 12.008, and the minor diesis 21.016 schismas, so practically 11, 12 and 21. There are also temperaments with the fifth tempered by a fraction of a schisma. There are 614.21264 schismas in an octave. A similar useful unit is 1/612 part of an octave, or one step of 612-tone equal temperament, because this temperament has extremely accurate approximations of fifth and thirds, and because 612 is divisible by 12. So one step is also very close to 1/12 of a Pythagorean comma and the schisma. More an interval than a measure, it is almost 7/72 part of an octave. Proposed by George Secor in a 1975 Xenharmonikon article as a generator for scales which are nearly 11-limit just. See also this page. This measure was developed by organ builder John Brombaugh to describe very small intervals as integer values. In this measure, the syntonic comma is almost exactly 660 Temperament Units and the schisma 60. Because 720 is divisible by all numbers from 2 to 6 and more, most temperaments can be described by only integer values. In a well-temperament, -720 TU must be distributed over the cycle of fifths. One Grad is 60 TU. There are 36828.62820 Temperament Units in an octave. See also this page. The tuning of Turkish classical music is Pythagorean which lends itself well to be approximated by 53-tone equal temperament, see comma. The comma plays an important role in this music and the smallest step of 53-tET is in between and approximately the same as the syntonic and Pythagorean comma. The Turkish theorist Ekrem Karadeniz has made a not very useful further subdivision into 200 parts, making 10600 to the octave. The notation systems of Arel, Ezgi and Yektâ Bey have special accidentals for the 1/53 octave comma and multiples of it. Proposed by Wesley S.B. Woolhouse in his 1835 Essay on musical intervals. This measure was chosen because in 730-tone equal temperament, the basic intervals of pure fifth of 3/2 and major third of 5/4 (and any combinations) are very accurate, 427.023 and 235.008 Woolhouse units respectively. See also this discussion.